So the first thing I noticed yesterday was that WikiLeaks is giving us what I call “numbered clues” vs. what appears to be “unnumbered hints” (I went back and renumbered clues in my previous post). For instance, on day three, WikiLeaks posted the above unnumbered picture of a weather buoy located in an area called Null Island. According to Wikipedia, Null Island is “around the point where the prime meridian and the equator cross,” more specifically at zero degrees latitude and longitude in the Gulf of Guinea. It’s called a “fictional island,” because there isn’t any actual land there so it’s not entirely surprisingly that it doesn’t show up in Google maps. Described as an “apparition” yet a “hive of activity in the world of geographic information systems (GIS),” the area serves as a landing ground for mapping mistakes. According to The Wall Street Journal, “…1,708,031 misguided location requests in the Mapzen system” were rerouted to Null Island in just one day. And Michal Migurski of Mapzen stated, “One of the reasons that Null Island became such a popular joke is that you are seeing the data-processing world and the geographers’ world bump into each other for the first time.” This reminded me of Julian Assange’s last appearance where he spoke about how in the digital and A.I. world, there are no longer physical boundaries between countries (forgive me if that’s not the right video). 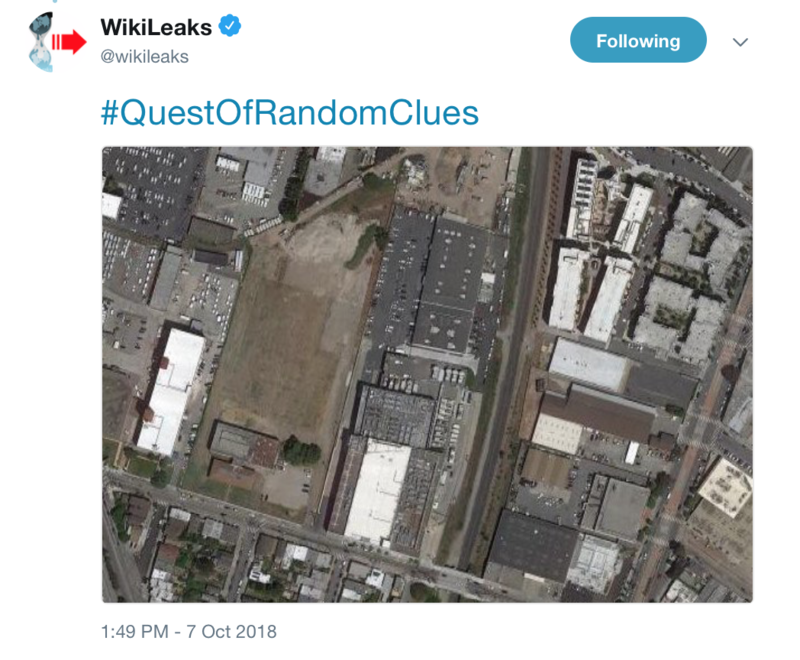 The fact that WikiLeaks chose this fictional location fits perfectly with some of their clues and tweets: “Mythic airplanes,” ghost planes at Shannon airport, shapes with hidden colors, animals that remain largely hidden (moles), and spying (Chinese microchips). I previously quoted Sara Brady who used the words “visibility and invisibility” to describe Shannon airport but couldn’t that be used to describe what’s in WikiLeaks’ hints and clues so far? But getting back to my point about clues vs. hints, since this particular buoy is in the Gulf of Guinea I want to point out that besides breaking down WikiLeaks’ first clue (357175638, 1395349266) to latitude and longitude points on a map that take us to the Canon building in Tokyo, if you move the decimal points, it also takes you somewhere in the Gulf of Guinea that looks particularly close to Null Island. Playing with the coordinates will also land you in Kenya, Niger, Sudan, Cameroon, Algeria, somewhere between Papua and Guam, and right next door to Malta. So it looks to me like we shouldn’t discredit Africa just yet, especially in light of Benghazi, Hillary’s new Libya, and the Gulf of Guinea where China (CNPC), ExxonMobil, Royal Dutch Shell, BP, and Chevron have long held an interest (oil). And speaking of Killary, @AnonScan tweeted this out on October 5, 2018, and I’m not sure if it has to do with WikiLeaks’ clues or not. My guess is that they’re referring to WikiLeaks’ birthday and the screenshot they posted looks exactly like the typecast used in WikiLeaks’ published emails. However, I couldn’t find it (maybe someone else can?) so I could be wrong. As to what WikiLeaks’ followers missed or the meaning behind lizard people, secure servers, and CMS (which could stand for “Hacking and Content Management System), you’re on your own. And just for you bloggers out there, WordPress appears to be the most hacked content management system “on record.” So there’s that (picture a “thinking face” emoji inserted right about here). The reason I bring up this tweet (besides the fact it might have something to do with WikiLeaks’ clues) is because they added a second tweet that links to older tweets about Hillary Clinton and her emails, the Clinton Foundation, Abedin, China (accessing her emails), Benghazi, and Julian Assange’s statement, “Our source is not the Russian Government,” to Russian allegations. So here’s our second hint, not clue. Going back to those coordinates from WikiLeaks’ first clue, as noted previously they take you to a Canon building in Tokyo, Japan. Within thirty minutes of WikiLeaks’ tweet above, someone on Twitter realized that the picture is the same building from the Tokyo coordinates. Everyone seems to agree that this is the Canon West Tokyo Data Center because sometimes a picture, especially one taken directly from Canon’s own website, doesn’t lie. United Layer, a private cloud network, located at 200 Paul Ave., Suite 110, San Francisco, California based on hex codes found in the colors of this WikiLeaks’ clue. Bingo. The smooth operator in the first email is Brazilian banker Mauricio Schulman. In the second email, the two firms that Congen had “located” were Brazil’s Soma Equipamentos Industrials SA and Temat Ltda. Rrepresentacoes Tecnicas. Canadians were the ones who got their fingers burned and the spokesman who declined to speculate was in reference to an agreement between Brazil and Argentina. What any of that means, I have no idea. With any luck, we’ll get a hint. WikiLeaks’ third hint was an aerial view of the Hibernia Atlantic Dublin International Exchange Center at the Clonshaugh Industrial Estate in Dublin. This obviously relates back to their clue about Shannon airport where the CIA spends their time running rendition planes. At the Exchange you’ll find GTT Communications (cloud services), Magnet Networks (cloud services), Metronet UK Ltd., and North West Electronics. Oh, and look at that. Amazon subsidiary, Amazon Data Services Ireland Ltd. (cloud services) is doing their thing there, too. Visible but not visible. Irishtimes.com has posted a handful of articles about the subsidiary here (thanks @BellaMagnani). WikiLeaks last hint so far today appears to be an aerial view of United Layer which online users already found using the hex codes in Clue Three’s shapes. I’m pretty sure that @welltraveledfox nailed this clue with this, a link to a PGP wordlist that has all of the words WikiLeaks used above on it. The only thing I know is that the words can be converted to “5D A4 C6 C9 F2 E6 OC 6B F2 24 CF A5 7B 22 33 79 E1 65 7D 4D,” and yes, I realize this isn’t very helpful. When I get more, I’ll update. Honestly, this whole thing is fairly easy to understand once you know how it’s structured: Numbered clues are being dropped and then hints follow to support each clue. My guess is that we’ll be seeing hints to Clue 4 and Clue 5 in the next day. The question is what does it all mean although I think we should keep in mind the whole invisible vs. visible thing: Moles tend to be underground (unseen), rendition planes (Shannon airport), Amazon (secretly?) working at the Exchange, colors and hex codes hidden in shapes, and hackers etc. etc. So what’s hiding in the United Layer building, the WikiLeaks documents, and the PGP word list clues? My guess: Data. Okay, so whatever. I’m not sure if my compilation so far has made any sense so I’ve simplified it below with what we have so far. If I’ve made any mistakes, let me know and I’ll correct it. Drawing of a mole that dates back to WikiLeaks’ beginnings. Code included in tweet breaks down to lat and long points in both Tokyo and the Gulf of Guinea. Everyone originally thought this was about the Shannon Airport where the U.S. uses rendition planes (okay not everyone, @welltraveledfox was on top of this and I should have listened). However, the clue is related to the GTT Communications Hibernia Atlantic Dublin International Exchange Center in Dublin. HINT 3: Aerial view of the Hibernia Atlantic Dublin International Exchange Center at the Clonshaugh Industrial Estate in Dublin. Relates back to Clue Two. HINT 4: An aerial photo of the building where data company United Layer resides. Relates back to Clue Three. The four lines in the clue appear in four different WikiLeaks documents. For those documents go here.